my charging light comes on during drive, what does it mean, what shall i do? the battery warning charging light function is not an essential function in the working of this regulator. Even if it does not work, regulator may well be working. Best way to test is to disconnect battery, start the engine (on relay systems disconnecting the blue wire before to get it started) and switch on headlight. If it shines, both generator and regulator are working. You can not however reliably conclude from the reverse case that the parts are defective, as the problem can also be in the wiring or the bulb itself. The battery warning charging light is an option. It may be used or just left out (by not disconnecting the green/red wire). Using it or not does not make any difference at all to regulating/rectifying. Not all motorcycles have a battery charge indicator. If you opt to drive without battery than the function is not available either. Both our 6V regulator 80 50 699 06 and the regulator 73 00 799 50 do not have this function. The battery warning charging light facility is based on a transistor inside the regulator. This transistor is connected to the rectifying diodes. Is there voltage (that is generator is running and producing) than the transistor cuts off the connection between ground and the green/red wire at terminal 6. Without voltage at the transistor, the green/red wire is connected to ground. with that the indicator bulb - with one side to plus and the other to the red/green wire will shine. as soon as there is voltage and the transistor cuts off, the bulb will stop shining. As the transistor never cuts off 100%, you might see in the dark a little glow of the bulbs. The whole thing surely only works with a battery present. without a battery nothing will shine at engine standstill and during engine run the indicator light will show some (not full) lighting by accident. ergo. without battery do not connect the red/green to anything. We know that some people want to use the red/green wire to switch a relay for various things (say safety relay preventing e-start with running engine). this will not work (we have tested at length) as the current through the transistor is not adequate for this. The battery warning charging light facility is a circuit which is additional to the functioning of the regulator/rectifier. Even if this function is faulty, the main function of the unit may not be impaired. 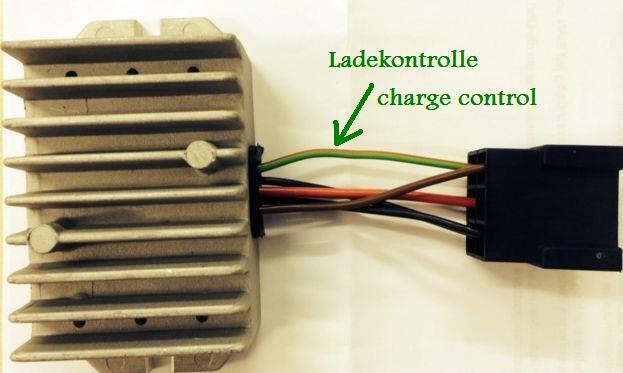 Malfunction of the battery warning charging light facility may be caused by connecting the green/red wire directly - without the pilot bulb - to 12V DC or any AV voltage from the alternator. This malfunction may manifest by either constant shine of the bulb or total absence of shining. Note: the battery warning charging function may also be impaired by problems in your bike electrics. Simple test: disconnect the wire running from the pilot to pin 6 of the regulator (green/red wire). Switch on power - with working battery, engine not started) and hold the wire now disconnected from the green/red of the regulator to ground. The bulb should shine. Take the wire off from groujn d again, shining should stop. If it does not behave like this, the problem is in your motorcycle (wire to pilot light, bulb holder, bulb, main switch etc). Both the 6 V version of this regulator and regulator 73 00 799 50 do not have this facility.